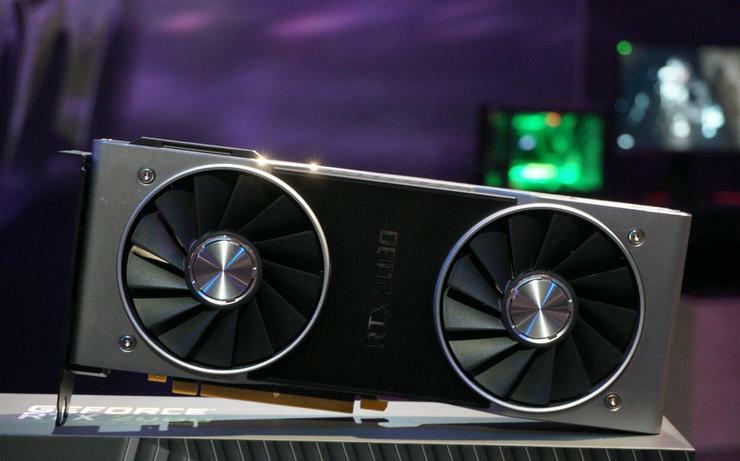 Nvidia’s future-focused reveal of the GeForce RTX 2080 and RTX 2080 Ti admirably outlined the gorgeous potential of real-time ray tracing, but left gamers hanging on a key question: How will the new Turing-based GPUs perform in traditional non-ray-traced games? With preorders already open for GeForce RTX graphics cards, it’s a crucial detail. Well, wonder no more. On Wednesday, Nvidia pulled back the curtain on how much faster the GeForce RTX 2080 is compared to the GeForce GTX 1080, and revealed some additional information about new RTX-boosted software features, including a massive upgrade to Ansel super-screenshots. But first, the hard(ish) numbers. Nvidia expects rasterized (read: normal) PC games to run about 1.5 times faster on the GeForce RTX 2080 than the GeForce GTX 1080, as you can see in the graph below. 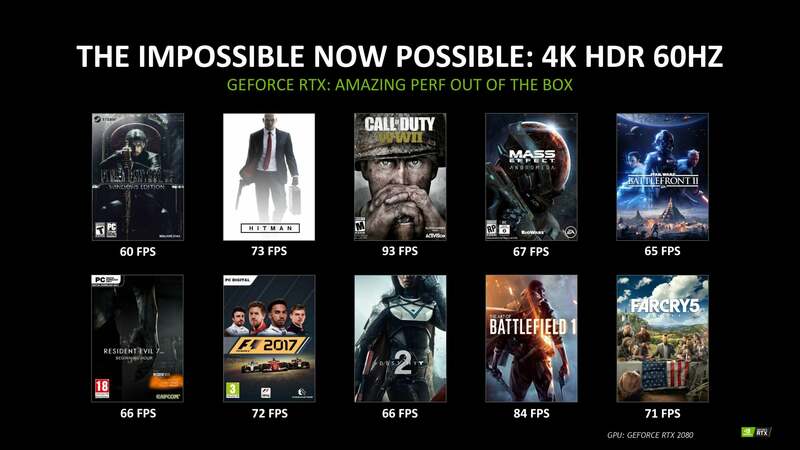 Games that take advantage of the new Deep Learning Super Sampling technology for the GeForce RTX series are roughly twice as fast on the 2080, Nvidia says. Note, however, that this chart measures 4K performance alone. A second image released by Nvidia shows the GeForce RTX 2080 surpassing 60fps at 4K resolution in numerous top-tier games, and almost cracking 100 frames per second in Call of Duty: WWII. Exact graphics settings for the games weren’t listed, alas, but between the previous chart and what we know about the GTX 1080’s performance in these games, expect these numbers to be accurate with eye candy cranked to fairly lofty levels. All vendor-supplied benchmarks should be taken with a pinch of salt until verified by third-party reviewers, but Nvidia’s marketing claims tend to be accurate (albeit sometimes only in very specific scenarios). 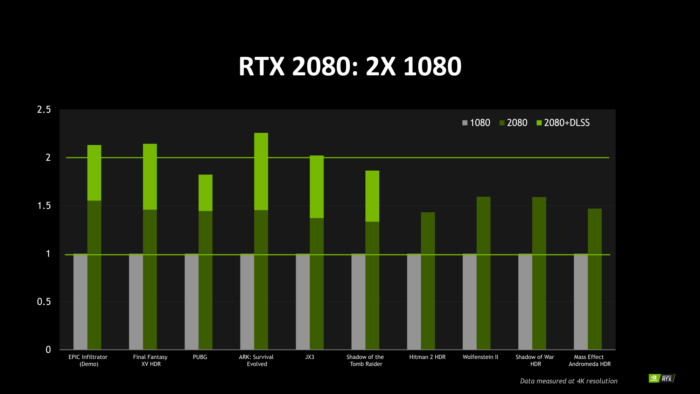 If you’ve been considering preordering the GeForce RTX 2080, but wanted to hear more information about traditional games performance first, these numbers should alleviate some concern, especially if you’re playing at the tested 4K resolution. Nvidia didn’t dish out performance details for the GeForce RTX 2080 Ti. However, it packs roughly 50 percent more CUDA cores than the GeForce RTX 2080, at 4,352 vs. 2,944. It must be a monster at 4K gaming in traditional rasterized titles. Developers can use Nvidia’s new Deep Learning Super Sampling (DLSS) to speed things up even more. Nvidia hasn’t explained how DLSS works at a technical level, saying only that it’s “a technology that applies deep learning and AI to rendering techniques, resulting in crisp, smooth edges on rendered objects in games”—a description that sounds like it takes advantage of the dedicated tensor core hardware new to the GeForce RTX series. At Gamescom, Nvidia showed journalists a side-by-side view of Epic Games’ Infiltrator demo, one running on a GTX 1080 Ti with Temporal Anti-Aliasing enabled, and the other on a RTX 2080 Ti with DLSS active. The RTX 2080 Ti demo ran nearly twice as fast, flirting with 60fps throughout, and looked vastly sharper. Here’s a list of every PC game that will support ray tracing or Nvidia’s DLSS. 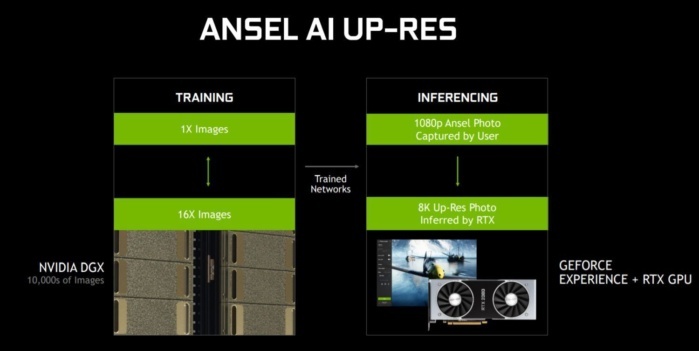 In addition to the GeForce RTX 2080 performance details, Nvidia also announced that its supercharged Ansel screenshot software is officially coming to 22 upcoming games, including heavy-hitters like Hitman 2, Prey, Metro: Exodus, Frost Punk, Pro Evolution Soccer 2019, and of course, Battlefield V.
Ansel is tapping into the big brains of the GeForce RTX graphics cards, too. GeForce RTX 20-series cards can access two additional features that tap into their RT cores and tensor cores, respectively. Ansel RT makes ray-traced scenes look even more lavish when you aren’t moving the camera by spitting out additional rays for extra polish. The AI Up-Res feature, on the other hand, can increase the resolution of standard HD screenshots all the way up to 8K for increased clarity when you zoom in close. As a massive fan of Ansel, I can’t wait to try these advanced tools out. Older Nvidia GPUs will still be able to access Ansel in supported non-SDK games, but they won’t be able to access the RTX-exclusive features, a free camera, or the ability to take 360-degree screenshots.